I couldn’t be happier to have the privilege of calling myself a Mexico wedding photographer. Most destination wedding photographers are living in the US or Europe but being based in Mexico City has enabled me to explore what I consider to be the most underrated country to have a destination wedding. From Baja California to Oaxaca to Guanajuato, Mexico is full of places unspoiled by overexposure on blogs and social media. My goal is to guide you through everything my experience being a Mexico wedding photographer has taught me, from where to consider getting married in Mexico to what you should look for when hiring a wedding photographer in Mexico. It’s hard to know where to begin when it comes to finding a wedding photographer in Mexico. The internet has made it easier to find good candidates but the overload of options often results in decision paralysis. It might be easier getting a referral but you may not have the Mexico wedding photographer you want to hire in your network! For those struggling with hiring the right destination wedding photographer, here’s some advice on where to start. Should I Hire a Local Mexico Wedding Photographer? The decision to find a local Mexico wedding photographer or to hire from somewhere else isn’t an easy one to make. Hiring local has a lot of advantages. You’re likely to find someone who speaks Spanish, which may come in handy for any number of communication-related problems. A local wedding photographer in Mexico has intimate knowledge of the area that even a well-researched foreigner couldn’t duplicate. To top it off, hiring local means no travel fees, which can range from savings of $500-$1500 in some cases. Hiring from another country outside of Mexico comes with a handful of pros but not as many as hiring locally. If you’re not limiting your choices to Mexico, you’ve essentially got a pool of unlimited options from around the world. It’d be hard to imagine not finding a single qualified destination wedding photographer in Mexico but for those who are fixed on a particular photographer, hiring a non-Mexican may be necessary. I’d only consider bringing someone in from another country if I found a destination wedding photographer I couldn’t part ways with. In all other situations, I recommend finding a local destination wedding photographer in Mexico. In my experience, there’s no single best way to find your Mexico wedding photographer. I’ve had brides referred to me that didn’t work out because there simply wasn’t a good fit. I’ve also been hired by a couple I didn’t meet until the wedding day that ended up being one of my favorite weddings. Searching online or through social media can lead you to incredible talent. My Instagram is how half the people who find me online are able to access not only my portfolio but a bit of my personality and how I like to work with my clients. Social media has changed the way couples are able to look for the destination wedding photographer of their choice, for the better in my opinion! As great as finding the right Mexico wedding photographer online can be, there’s something about getting a personal referral that offers a unique peace of mind. The biggest upside of a referral is the extra level of security in knowing not only the quality of the photos you’re getting but a full look into what you can expect from your wedding photographer. The value in having someone who’s friendly, flexible, and has a quick turn-around time is indispensable, and it is often overlooked. The downside, on the other hand, is a lack of options. The Mexico wedding photographer who shot your friend’s or relative’s wedding may not be who you’re looking for. If this is the case, I encourage you to lean on the internet to provide you with better options. I never advise a couple to compromise on who they hire to be their destination wedding photographer. Unlike many other vendors, it’s the one aspect of the wedding that could haunt you every time you look back at your wedding photos. Mexico is a lot bigger than most people realize. Choosing Mexico certainly isn’t the end of the planning process when deciding where to get married. If anything, a number of different potential paths are opened, due to Mexico’s massively diverse landscape. Mexico is filled with everything from mountainous regions to tropical jungle beaches to arid deserts to dense forests. So it begs the question, once I choose a Mexico wedding photographer, where should I have my wedding in Mexico? Mexico has thousands of miles of coastline, which means near-endless options for any couple interested in having a wedding on or near the beach. Depending on what you’re looking for, there are a number of different choices for anyone looking to tie the knot with sand in between their toes. Here’s what I’d recommend for anyone who’s still undecided on their Mexico beach wedding! The best sunset I ever saw in my life was in Oaxaca. Up until I visited for myself, I didn’t truly understand how beautiful this state’s coastline was. World-renowned for its gorgeous beaches and great surf, I recommend Oaxaca for anyone who wants to take the road less traveled when it comes to a Mexico beach wedding. Largely undiscovered by Americans, Oaxaca remains unspoiled by large crowds and expensive resorts. What’s left are authentic towns and cities with chill surfers, beach bums, and wide open shores. My time as a destination wedding photographer in Mexico has taught me that, in most cases, the less crowded the better. I’d choose Oaxaca to elope as well, its crashing waves and intimate beaches make for a lovely background for any couple to say ‘I do’. If you haven’t heard of or have yet to visit Oaxaca and are wondering where to start, make sure to check out more resources on where to get married in Oaxaca. The first place that made me start to consider being a destination wedding photographer in Mexico was Tulum. I’ve never been shy about my appreciation of Tulum, from its gorgeous beaches to the unique bohemian vibe that stands out from anywhere else. It’s rare for a place to draw you out of the rest of the world and give you the feeling of truly being on vacation but Tulum is one of those places. Sharing an advantage with Oaxaca, Tulum is the cooler, less crowded neighbor of the more popular Cancun, a 2-hour drive up the Yucatan coast. During high season, you’ll still find beaches full of tanning foreigners but far less so than the more commercial parts of the Yucatan peninsula. Being a Mexico wedding photographer means sometimes having to take those jobs in Cancun too but I can easily say I prefer Tulum. For those looking for a one of a kind boho-chic jungle paradise, you’ll find it with Tulum. If that kind of vibe piques your interest and you want to know more, read 5 reasons you need to have a Tulum wedding! For those who don’t feel the allure of the beach and prefer the hustle and bustle of a city or the charm of a small town, Mexico has an abundance of options for you. From one of the biggest cities in the world to cute and quaint villages, being a Mexico wedding photographer has taken me through the amazing diversity contained in one country. Here are a few suggestions for those opting for a more traditional wedding in a town or city! I live in Mexico City, so I’m more partial to it than the average destination wedding photographer but I also objectively think it’s one of the most incredible cities on earth. There are 16 municipalities, each with several colonias that all each have their own distinct personalities. I live and spend most of my time in Roma but I also have a strong affection for places like Coyoacán, La Condesa, and Juarez. Mexico City is not only bursting with life and culture but is also far more affordable than a comparable popular destination in the United States or Europe. You’ll also eat some of the best Mexican food of your life for less than you’d spend at a Chipotle in the US. For those who are more traditional, options for churches that are hundreds of years old with unique history are abundant in many neighborhoods. Choose Mexico City for your destination wedding if you love cities with a ton of personality and unlimited options. 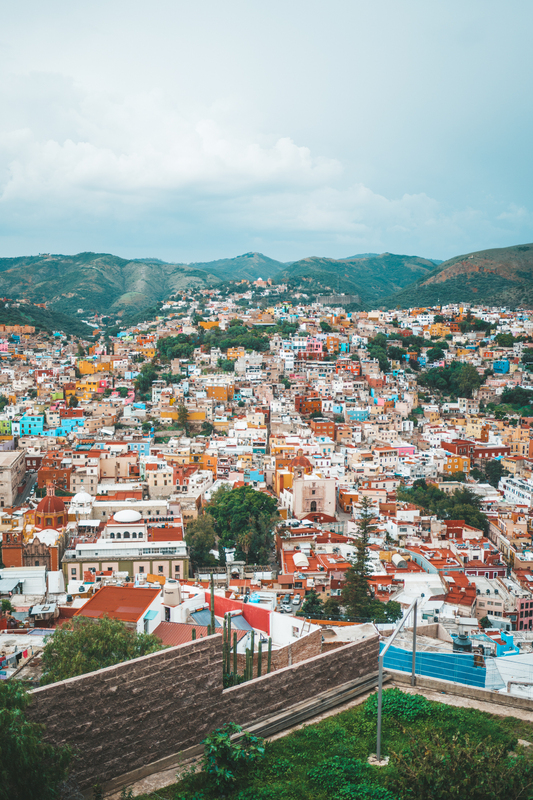 You may not have heard of Guanajuato but it’s likely that you’re acquainted with its more popular and well-visited neighbor, San Miguel de Allende. Only a few hours from Mexico City, Guanajuato is one the of many historically important towns in the state of Guanajuato. I couldn’t believe this gem had been hiding under my nose my entire life, because it’s just as charming as a place like Brugges or Hallstatt. Cobblestone steps, every wall a different color, and amazing rooftop views all spell out an absolute dream for a Mexico wedding photographer. If you’re looking for everything a charming historic town has to offer without the crowds, choose Guanajuato for your Mexico destination wedding or elopement! If you’re still looking for options, make sure to read where to get married in Mexico, which I wrote before I even became a full-time Mexico wedding photographer, for even more choices across the country! What Makes a Good Mexico Wedding Photographer? Once you’ve discovered a good pool of candidates, it comes time to judge who you’re going to hire to be your wedding photographer in Mexico. I’ve been a destination wedding photographer for so long it’s sometimes difficult to realize that a person with no photography experience may not have the same critical eye I do. I can’t say how often I’m asked what to look for in a destination wedding photographer and have gone into detail about it before but not for Mexico. I wanted to be more specific about what to look for when booking a destination wedding photographer in Mexico, so here are 3 key aspects to keep an eye out for when hiring your Mexico wedding photographer! It’s critical that whoever you end up hiring to be your destination wedding photographer in Mexico has a thorough knowledge of the area. This includes crucial elements like knowing what time the sun sets, how to get to the wedding venue, and any local spots to get bridal portraits. Knowing how to get to the wedding venue may seem like splitting hairs but I didn’t realize how important it was until a fellow destination wedding photographer friend of mine told about a dilemma she experienced while shooting a wedding in San Francisco. She looked for Air BnB’s in the bay area, not realizing how expensive it was, and ended up booking her stay in the first town with any reasonable options over an hour and a half from the venue in the city. She experienced rush hour traffic on the way to the city and ended up being over an hour late, missing most of the “getting ready” part of the wedding day. A wedding photographer in Mexico will likely be able to avoid any of the hiccups someone not familiar with the area might experience. I have experienced communication breakdown in other countries like Greece where I wished so badly that I’d spoken the language. Luckily, being conversational in Spanish has me equipped me to be confident in my ability to communicate as a Mexico wedding photographer. I will admit, in many cases, English will be spoken wherever in the world you are, including many places in Mexico. Anywhere that experiences a lot of tourism is likely to speak English, so you probably won’t run into problems in places like Cancun or Cabo San Lucas. That being said, any rural or non-tourism heavy areas in Mexico are likely not to speak a word of English. In my book, this isn’t a deal breaker but it certainly will come in handy to have a destination wedding photographer who speaks the local language. Mexico has a ton of coast, which means, of course, a ton of beach weddings. It’s important you hire a Mexico wedding photographer who has experience shooting a beach wedding if you intend to have a wedding on the coast. When you’re closer to the ocean, the colors are different, the lighting is different, and most importantly, the wind is far more extreme than the average wedding. I’ve seen photographers struggle to work with the wind to get good shots on the beach and some of them are so inexperienced it’s almost comical to see their attempts at getting portraits. My first experience with extreme wind was in Iceland, so this may apply to those who are getting married in the mountains as well! Every location you choose to get married will have its upsides and its downsides, whether you’re having a wedding in your hometown or are going across the world. My time being a destination wedding photographer has taught me that Mexico, like other popular locations for a destination wedding, has its own pros and cons as well. Here are what I’ve discovered to be the pros and cons of having a destination wedding in Mexico! As far as destination weddings go, Mexico is a very convenient choice compared to popular cities in Europe. A shorter and more affordable flight combined with affordable accommodation means the barrier to entry for both you and your guests is considerably low. Flights from my hometown of Miami to places like Cancun and Mexico City are usually in the 200’s, even less than the cheapest cross-country flight. Part of the reason I moved to Mexico City and became a destination wedding photographer in Mexico is because of how affordable it is. I already mentioned how inexpensive it is to get here but once you arrive, it’s even more shocking how cheap everything is. The first lunch I had in Mexico City with my husband and his friend ended up coming out to 210 pesos which is $10.40. Not for each person but in total. At the time, I was living in San Francisco, where $10.40 can hardly get you a coffee and a bagel at most places. It’s not uncommon to find exceptional places to stay for less than $50/night in Mexico, which you’d be lucky to get a cheap motel for in the US. Transportation for a week is likely to cost less than a tank of gas when most Uber rides are between $3-$5. Lastly, Mexico is overall incredible. With its modern and ancient history leaving behind pyramids that are thousands of years of, amazing ruins, and thriving culture, it’s hard to not fall in love. On paper, being a Mexico wedding photographer makes sense but I made the plunge because of my heart for this country. I have more to say but I’ll gush more below when I talk about why you should choose to have a destination wedding in Mexico. If you haven’t experienced it for yourself, I highly recommend anyone to make the journey, you will not regret it. During the high season, Mexico is a popular spot for tourism. In some of the more tourist-friendly locations, Mexico can be crowded during spring break and the summer. The best way to avoid the crowds is to choose cities that don’t get a lot of American tourism. I’d also recommend choosing a time when it isn’t popular to visit Mexico like autumn or winter, with the exception of the week before and after Christmas. The best combo would be to choose a less popular town in down season if you’re looking for the least amount of people who may be crowding restaurants or beaches. For those who don’t speak Spanish, Mexico may present a language barrier. This is common across most popular destination wedding locations and is easily solved with a Spanish-speaking planner. This problem is, of course, completely invalid for any couple who speaks Spanish, which is not uncommon in 2018. A Spanish-speaking Mexico wedding photographer comes in handy too! As far as cons go, it’s hard to continue thinking of any when it comes to Mexico. There’s so little to complain about, I’d really have to split hairs to find even more item to list. The cons that do present themselves would be the same in any country where you’re doing a destination wedding, and certainly not exclusive to Mexico. This leads me to my next item, which I’ve been dying to write about this whole time. Why Choose Mexico for a Destination Wedding? Being a destination wedding photographer, I have no reason to be tied to any particular place because my work takes me all over the world but I very intentionally choose to live in Mexico. I’ve been lauding the wonders of Mexico throughout the article but I wanted to save the special praise for this section. Whether you’re already sold on Mexico or are only considering it, here’s why I think you should have your wedding in Mexico! The diversity of the beauty in Mexico is unreal. From the natural beauty in several of the world’s beaches to the man-made beauty in the colonial Spanish-era towns to the ancient ruins of the advanced Mayans to the bustling cities bursting with a culture that’s impossible to ignore, Mexico has something for everyone. I compare it to the Beatles – you may not like all their songs but there’s going to be at least one you’re guaranteed to love. I don’t think I could consider no longer calling myself a Mexico wedding photographer until I’ve explored every state in the country. It’s hard to understand how beautiful Mexico is for one main reason. I don’t think it’s been explored enough by high profile bloggers and media figures. Because it’s in our backyard, it doesn’t seem exotic enough, which is one reason why it could be underrated. As far as I’m concerned, I’d be more than content if Mexico stayed under-traveled. The fewer Mexico wedding photographers, the more opportunities I have to shoot incredible destination weddings in Mexico! One way the culture of Mexico manifests itself is through the number of vibrant colors that fill nearly every square inch of this country. I’ve seen this in other places like Positano and Cartagena but it’s far more widespread in Mexico. For a destination wedding photographer in Mexico, you couldn’t possibly imagine better backdrops than the colorful towns this country is filled with. It seems like every corner holds a different color wall, like an outdoor studio photographer playground. The amount of variety and options for portraits is a dream, with each charming town presenting a new color palette. For artists and creatives, it’s idyllic but for a wedding photographer in Mexico, it’s an absolute paradise. I brought this up earlier when mentioning a few of the pros of having a wedding in Mexico but it’s hard not to bring up again just how affordable Mexico really is. I don’t feel bad about encouraging friends to visit because I know how little they’ll spend while they’re here. It’s the same reason I encourage people to have a destination wedding here. I know any couple will have to compromise on far less than what they’d have to compromise for in the United States or Europe. Both the euro and the dollar stretch so much in Mexico, it’d be hard to imagine having to make many sacrifices because so much more is allowed in your budget. As far as what you get for your money, there are few places that compare to Mexico that are so accessible to the United States. For example, Bali may be just as affordable but it’s also across the world – there’s a reason I’m a Mexico wedding photographer rather than a Bali wedding photographer. Mexico has a big advantage when it comes to how much of the year it’s possible to have a destination wedding. Wedding seasons in most cities are dictated by the times of year when the weather is suitable for people to be comfortable outside. This rule is broken for elopements when a couple is willing to bear the cold for epic photos but usually doesn’t apply for destination weddings. Here are some of the advantages of having a destination wedding in Mexico for each season! The sting of Winter in most places begins being felt even before the official start date but in Mexico, the subtle drop of temperature doesn’t usually happen until January. How much it’s felt depends on your altitude, with even the mountain-towns reaching lows in the 50’s. The low-lying coastal areas usually don’t dip below a warm 70 degrees, even in the throes of winter, making them perfect for a comfortable destination wedding. The places that get very hot during the summer months, like the Yucatan and Baja California Sur, tend to enjoy delightful warm temperatures during the winter months, which is why they’re so popular with part-time winter residents. To have the traditionally harshest month still be more than suitable for a destination wedding is a big advantage of being a Mexico wedding photographer – my season is essentially all year! My favorite season to have a destination wedding in Mexico might be Spring. Depending on the day, I could say it’s winter or autumn but most times I return to Spring because it’s such a special time of year. The days are longer and dryer which means by March 20th, there’s even more time at the beach unspoiled by rain. If possible, have your wedding during Semana Santa, aka the week of Easter, when most Mexicans are on vacation. During Semana Santa, you’re likely to encounter less traffic and fewer crowds. Remember that, in order to avoid the craziness, it’s best to visit cities that aren’t plagued by college students on spring break. Luckily, they’re usually concentrated in a few areas, so there’s still plenty of options left for a destination wedding in Mexico during the Spring months. Although summer may be a great time to visit Mexico, I wouldn’t necessarily suggest it as the best time for a destination wedding. I first visited Mexico in the summer and, even being from Miami, found the temperature uncomfortable by midday. Don’t get me wrong, even during that time, I was still considering dropping everything to be a destination wedding photographer in Mexico. The hottest, most humid, and rainiest places are all coastal, so you can easily avoid the discomfort of summer in Mexico by opting out of these particular cities. For example, Mexico City is still very temperate and comfortable during the summer months because of its altitude and maintains highs in the 70’s. This is why, as long as I’m a Mexico wedding photographer, I will continue to be based there! For any first time visitors to Mexico, I will always recommend Autumn. Smaller crowds, cooling temperatures, and the best cultural events of the year all line up between September and November. The unbearable humidity and constant rain of the summer retreat in the coastal areas, making a beach wedding suitable again by the time October rolls around. Mexico City starts to cool down in the evenings again, with lows in the 50’s, along with the rest of Central Mexico and the more mountainous regions. It’s also worth it to plan around either Dia De Los Muertos in early November or Mexico’s Independence Day on the 16th of September. The former for an unforgettable cultural experience and the latter for the best party of the year. Lastly, choose fall for your destination wedding in Mexico if you’re looking to save the most money. Autumn is generally low season, so you’re likely to find the best deals during these months. Calling myself a Mexico wedding photographer was never something I expected. It’s also a part of my life I couldn’t be more grateful for because destination weddings in Mexico are just as, if not more amazing, than anywhere else in the world. I’m privileged to be a wedding photographer in Mexico and couldn’t imagine being anywhere else! If you feel the same way about Mexico, you’re almost guaranteed to have an incredible destination wedding, no matter where or when you end up choosing. Whether you’re a local Mexican couple or are coming from somewhere else, you’ve made the right decision by choosing this beautiful country to host your wedding. For any Mexico wedding photographer-related needs, make sure to reach out at 786-683-9168 or fill out a form submission. I can’t wait to hear you and your fiance’s story and why you decided to go with Mexico for your destination wedding!